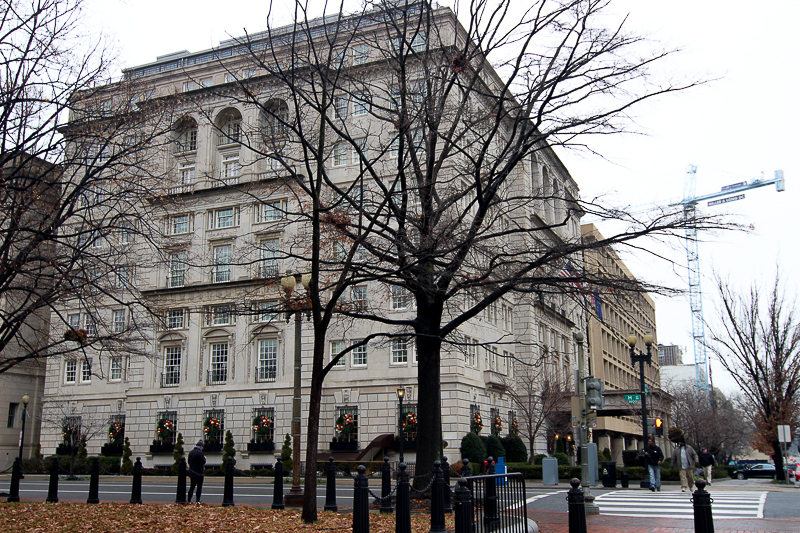 The Hay Adams Hotel at 16th & H Streets in NW Washington DC has as its motto, “Where nothing is overlooked except the White House.” It’s noted for its fine dining, superior accommodations and the spirit of Clover Adams who committed suicide and now leaves the faint scent of almonds behind. I’d also heard that the Hay Adams was haunted by a woman – Clover Adams, wife of Henry Adams – who committed suicide after falling into deep depression over the death of her dear father. Clover is sometimes seen by staff and guests but commonly manifests herself in the living world with the fragrance of almonds. Clover was an accomplished photographer with her own darkroom, and her husband Henry found her lifeless body in front of their bedroom fireplace after she ingested the darkroom chemical, potassium cyanide – which smells like almonds. She was only 42 and never got to live in their dream house. 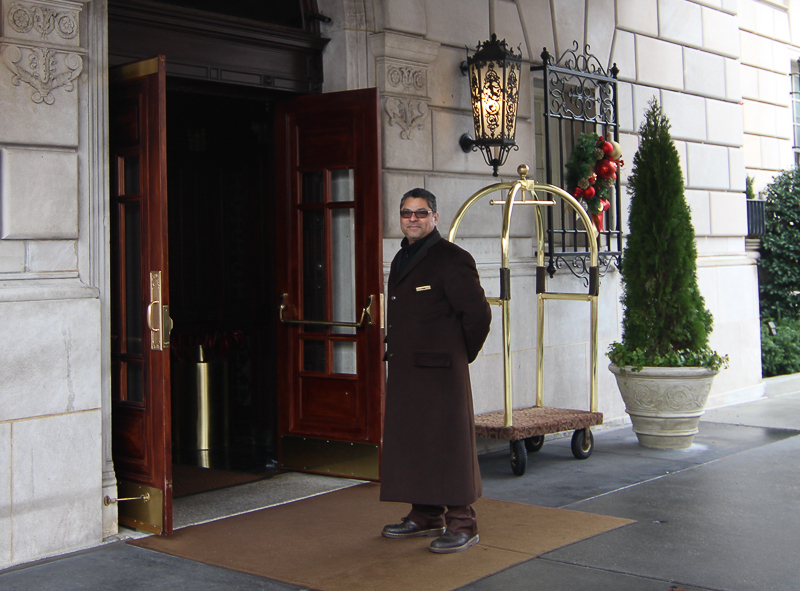 Doorman at the Hay Adams Hotel Entrance. The staff lives up to the Hay Adams service promise. At our sidewalk approach to the hotel, we were greeted and referred to the lobby. In the lobby, we were greeted and escorted to the dining room where our coats and umbrellas were collected and stored. Then we were graciously led into the sunny dining area itself, and seated at a table overlooking Lafayette Park and the White House. It was royal treatment. 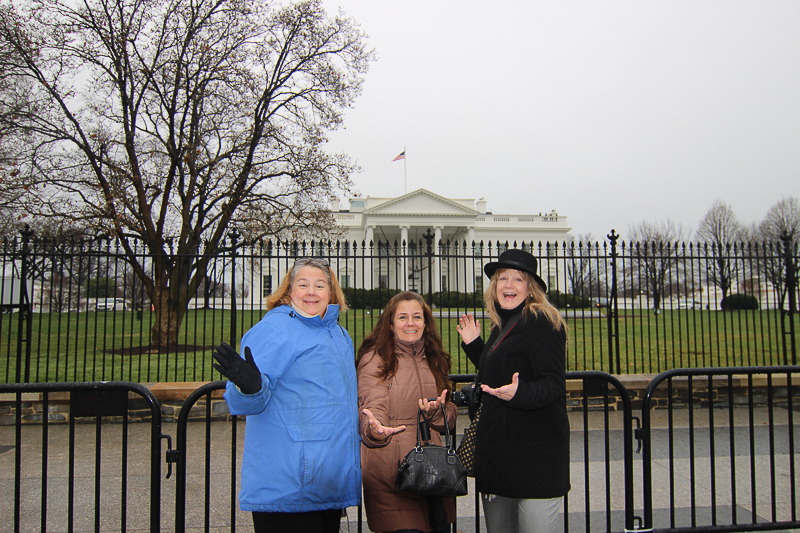 We wondered if they knew that we were really a bunch of middle-class hags…. or … maybe because we were so middle class they were keeping a watchful eye on us. I ordered a mimosa sipped it while enjoying the view out the window of the White House decorated for Christmas. 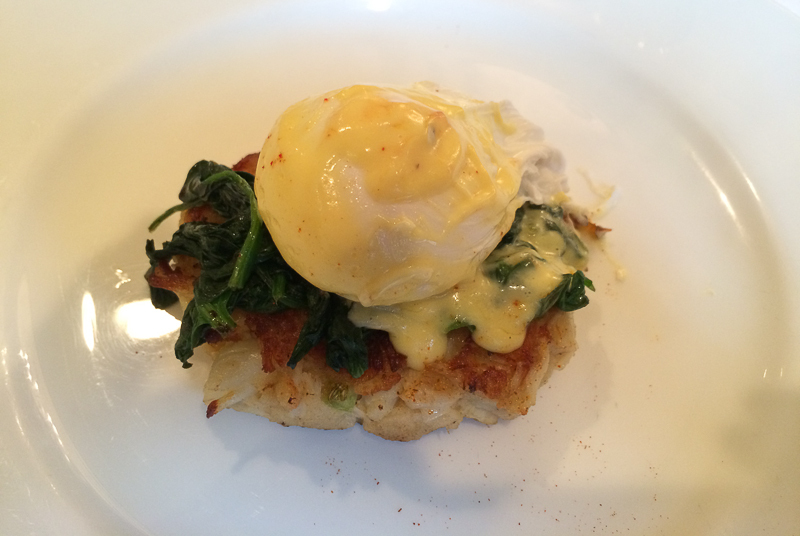 Then I dove into my Chesapeake Bay Crab Cake Benedict with sautéed spinach and homemade Hollandaise sauce. Usually, I don’t order crab when off the Eastern Shore because I’m almost always disappointed. Off the Shore, the crabmeat is often tastless, acquired from Asia or South America without the pungent flavor of Chesapeake Bay crabmeat. But the flavors of the Bay were powerful in this backfin, lump crab cake crowned with a layer of spinach and a perfect poached egg. It was an unexpected, yet perfect combination, and just enough for breakfast, although I had room to scarf down a warm scone and butter. The breakfast, the setting, and the service exceeded expectations. We asked the server what famous people he had served at the Hay Adams and if they big tippers (keeping it classy). He said that Brad Pitt and Angelina Jolie stay there when they’re in DC and that they are wonderful people, polite, considerate and a joy to serve (no comment about the tip but we figured he wouldn’t have mentioned them if they were cheap). He also said that Morgan Freeman ordered a menu item in the “little plates” category and didn’t like the plate – thought it was too small – and he requested a bigger plate (which he got). Months later Mr. Freeman returned to the Hay Adams, ordered the same “little plate” dish and the server remembered his previous request and asked, “Mr. Freeman, are you wanting a larger plate?” And, yes….. Mr. Freeman’s “little plate” was replaced with one of a size more to his liking. As we were ready to leave the hotel, I was asking some questions about the hotel’s history, in particular, the story about the ghost of Clover Adams. The Food and Beverage Manager was dispatched to our table, and after answering a few questions offered to take us on a tour. What lovely surprise! We learned on his tour that the hotel was built in 1927 on the site of two separate houses that were built for John Hay and Henry Adams. As our host escorted us into the “Hay Adams Room” we overcome by the gorgeous floor to ceiling wood paneling, period ceilings and stunning Christmas decorations. 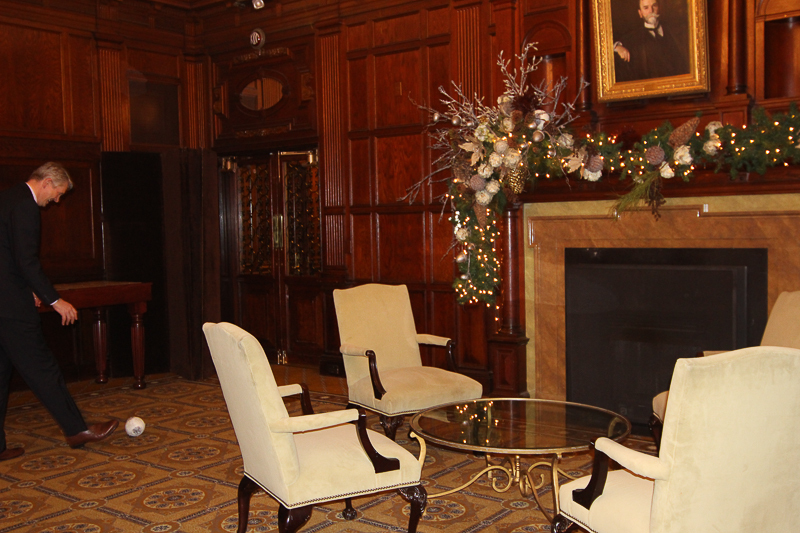 There in the shadow of the Hay and Adams portraits, our host explained that the wood paneling was crafted from repurposed wood that was taken from the original Hay and Adams homes before they were razed to build the hotel. Then he told us a little about these two men. 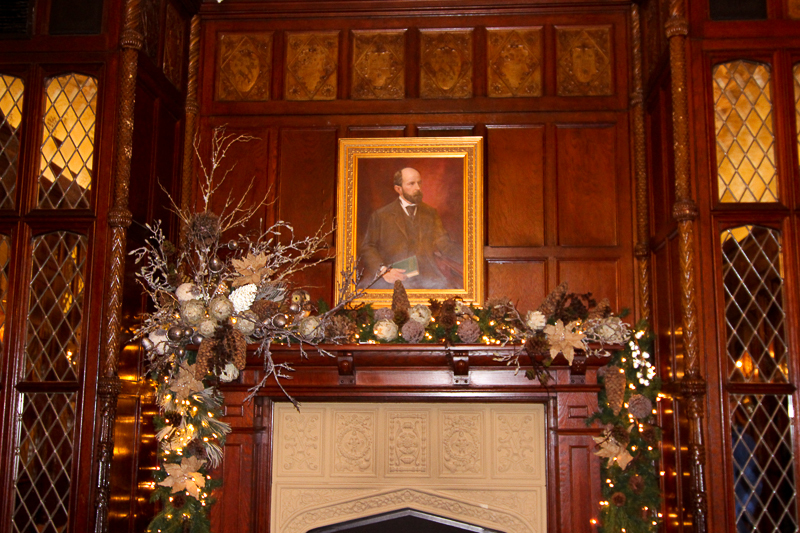 John Hay and Henry Adams were pillars in the community – Hay being the private secretary to Abraham Lincoln and later serving as Ambassador to the UK and Secretary of State under two US Presidents, and Henry Adams is the grandson of John Quincy Adams and a notable writer an connoisseur of the arts. They were intellectuals and part of the Washington DC cultural scene. They hosted grand parties at their houses that attracted artists and notables particularly in the literary field including Mark Twain Henry James and Edith Warton – a kind of “Lady Gregory’s Coole Park” in Washington DC. Both men were writers as was Henry’s wife, Clover (Marian Hooper Adams). Hay and Adams were so prominent in the social scene of the day, that the corner they lived on became forever associated with their names, even after their deaths when their houses stood vacant and falling into disrepair. There were a few subsequent owners, but in 1927 a developer purchased the properties, razed the houses and erected a the Italian Renaissance hotel that stands there today. And they kept the corner’s identity and named it the Hay Adams Hotel. The staff didn’t want to admit to any hauntings (ghosts are so low class), but they politely spoke about what others said they’d seen and heard. 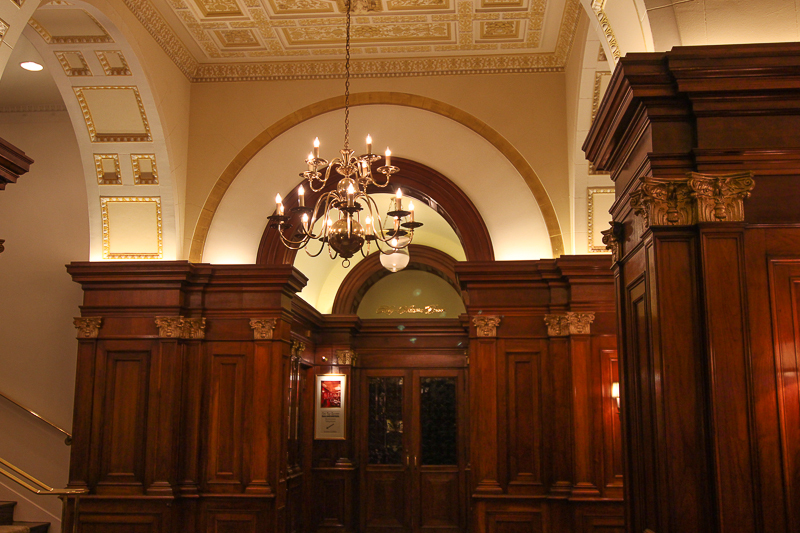 The concierge said that the chandelier at the entryway to the Hay Adams room has been seen swaying. And yes … there’s that faint smell of almonds. 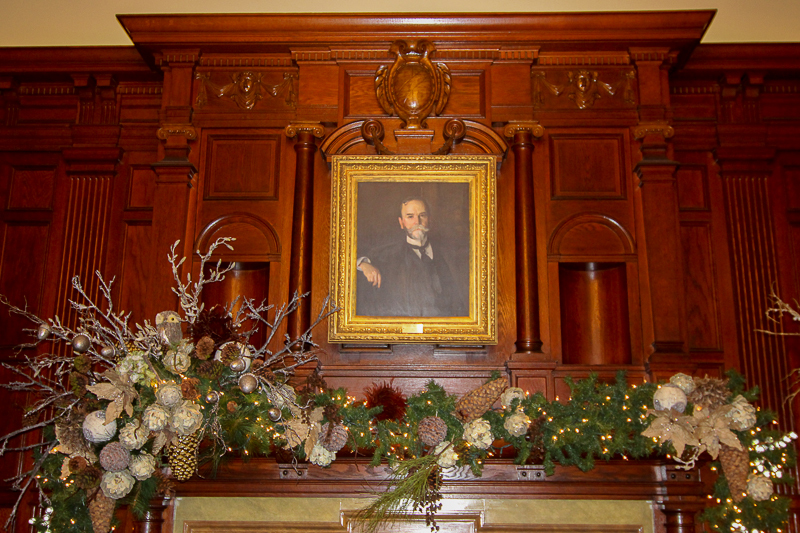 But while we were chatting about the ghost thing in the Hay Adams room, a large styrofoam Christmas tree ball on the tree located at the right of the John Clay portrait, fell off the tree and forcefully rolled a good twenty feet across the room, right to where the manager was standing. And three of the four of us hags saw and heard a person near the tree. Our initial perception was that the person knocked the ball off the tree and then commented on it. But when we all refocused, we realized there was no person. I clearly saw a person in my peripheral vision…. period. I know I did. So it was a little unsettling for a minute. But the manager said there was no one there, with a little smile he picked the stray ball and returned it to its place on the tree. The four of us were dumbfounded. …. and the tour continued. 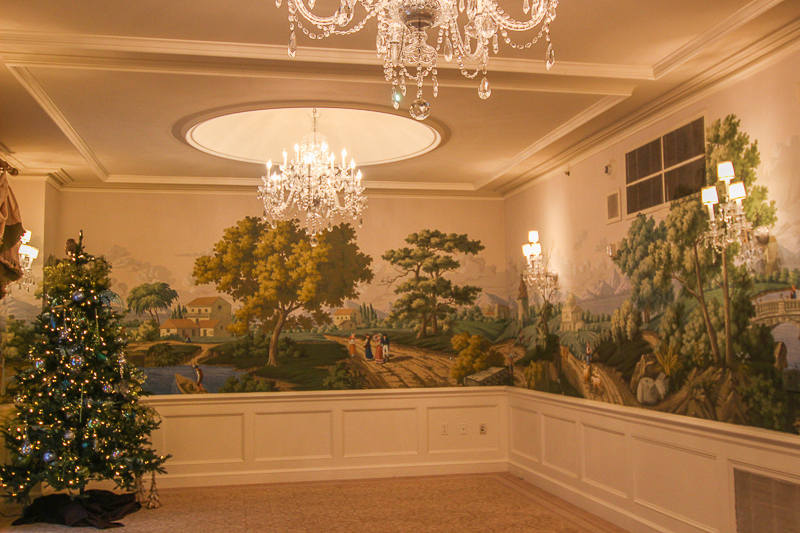 The Hay Adams Room. The tree was on right side of the Fireplace and ball ended up on the opposite end of the room rolling right to the manager. He is pictured here running after the ball. We were graciously escorted to other regions of the hotel and shown old photographs of the building, and the Hay and Adams homes that occupied the site previously, and some old pictures of the Lafayette Square streetscape. The entire experience was handled warmly, professionally and graciously. It was all so unexpected and delightful. Another meeting room at the Hay Adams. I went home and read more about the Clover Adams haunting of the Hay Adams Hotel. She was born into a wealthy Boston family surrounded by art and literature. Her mother was the poet, Ellen Sturgis Hooper, and her childhood involved associations with famous New England writers such as Nathaniel Hawthorn, Henry David Thoreau, and Ralph Waldo Emerson. 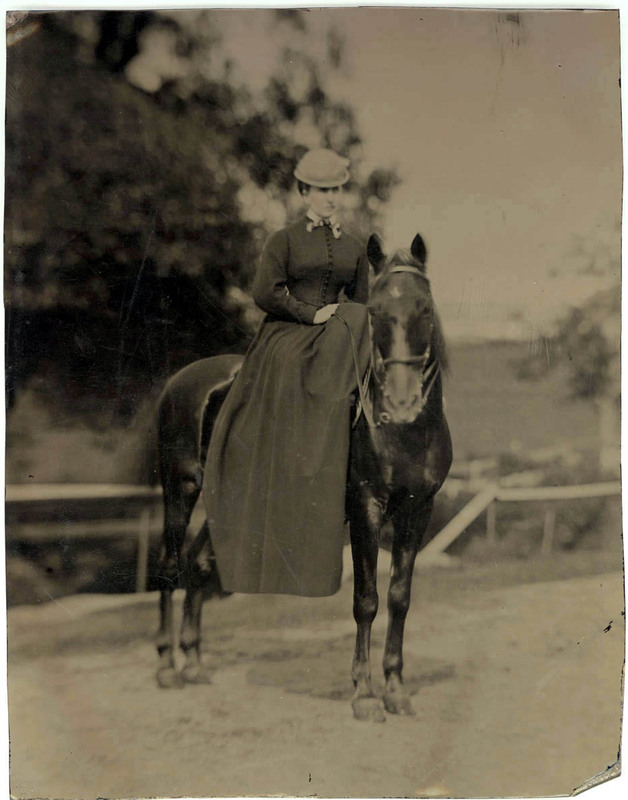 Clover’s artistic ability was seen in her own writings, but she is most noted for her pioneering efforts in the art of photography during the late 1800s. Her body of work is extensive, and it was a chemical used in picture developing – potassium cyanide – that she ingested to end her life. Clover never actually lived in the Henry Adams house on the corner of 16th & H where the hotel now sits. She ended her life at age 42 in the temporary home on H Street where the couple was staying while their dream house was being built. Her suicide was a shock to everyone. John Hay remembered Clover in a letter to Henry Adams stating that she was a “bright, intrepid spirit…which made your house such a one as Washington never knew before and made hundreds of people love her as much as they admired her.” Some believe that Clover Adams was the inspiration for Henry James’ novel Portrait of a Lady . Henry Adams grieved terribly for his lost wife. In a letter to one of Clover’s friends he stated,”During the last eighteen months I have not had the good luck to attend my own funeral, but with that exception, I have buried pretty nearly everything I lived for.” Henry burned his wife’s letters and never spoke of her or his grief over her loss. But out of that grief, Henry Adams commissioned a memorial to be crafted for his late wife that became one of the most famous and admired works of art in America – as well as one of mystery and ghostly associations. Augustus Saint-Gaudens created bronze cast statue that marks Clover Adams’ grave in Rock Creek Cemetery. It’s a life-sized shrouded figure seated on a bench with closed eyes barely noticeable under the veil. There is no name, no date, no words inscribed to Clover’s memory … only the baleful stare of an androgynous, shrouded figure. Henry Adams was said to have asked the artist to create something that is a cross between Buddha and Michaelangelo’s Pieta. It took four long years for Saint-Gaudens to create it, but Adams was pleased with it and had it placed on his beloved’s grave. No name was even given to the statue, though later the name “Grief” became a common reference. An unauthorized copy of the same memorial was made by Edward Ludwig Albert Pausch and placed in Druidpark Cemetery in Pikesville. That figure became known as the infamous “Black Aggie” figure (another ghost story for another post). Eventually, there was so much publicity about the supernatural occurrences at Clover Adams’ grave, that the original statue was relocated to an unadvertised location on Lafayette Square near the Hay Adams Hotel. We found the statue – more on this in another post. A statue that currently marks Clover Adams’ grave is a replica of the original. They say that some people hear the mournful voice of a woman weeping in the Hay Adams Hotel, usually on the fourth floor. And the housekeepers apparently have been hugged by something they can’t see. Another legend is that Clover is much more “present” or active in the month of December… the month she died. We were there in December. Maybe it was she in the Hay Adams room wanting to make her presence known in her death-anniversary ripping an ornament from the tree in the Hay Adams Room and tossing across the room. Or maybe she doesn’t like those Christmas decorations. We’ll never know. Loved the travel account. 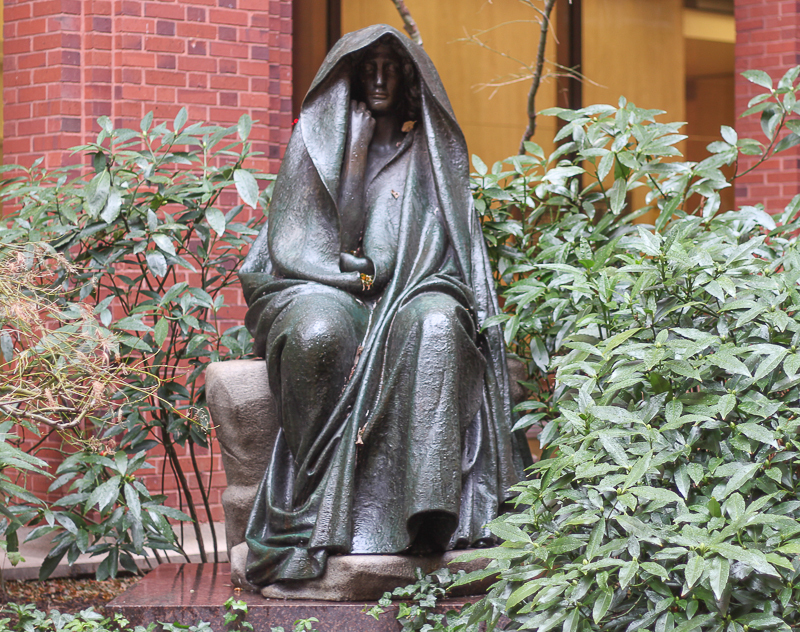 I believe the “Grief”statue is mentioned by John Galsworthy in the Forsythe Saga. Beautiful article. That was such wonderful TH Christmas trip. The Hay Adams was impeccable – fabulous food. I do recall when that ornament went zinging from the tree across the floor by that ghost of Christmas past, I thought I would swoon. I personally think Clover was happy we were there.